Not long after I read her post I started writing about my experiences with Tammy, Savannah, and anyone else who crossed my path. I modeled my conversations after how Jenny wrote, going against how I was taught to write in journalism classes. The original Beyoncé in all her glory. I know I’ll never come close to reaching Jenny’s level of success, but thanks to her and Beyoncé, writing became fun for me again. Since I was enjoying writing again, I wanted a Beyoncé of my own to remind me to write and that writing was sposed to be fun. 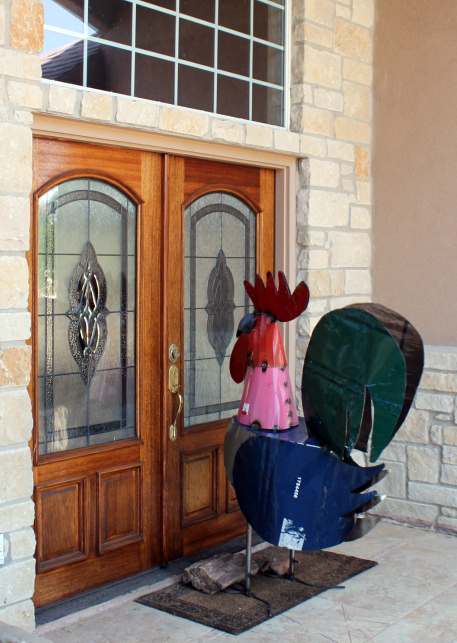 I knew there was NO WAY Tammy was going to sign off on a six-foot metal chicken – but then again neither did Victor, maybe that’s what makes Jenny so much funnier – so I started looking for a mini-version that I could sit on my desk. So when my Mom asked what I wanted for Christmas I sent her the picture of Beyoncé standing in front of Jenny’s front door and made sure to tell her that mine did NOT need to be that big. Yesterday we were sitting around my Mom’s house when Tammy’s phone rings. Mom: What’s that thing Jason is looking for? Be-something? Beyon, or something like that? Tammy: Well, you can’t really go to a store and ask for a Beyoncé, because it was part of a story. People won’t know what you are talking about. You’ll just have to look for a tin chicken or rooster. I’m not worried about Savannah, but I sure hope Rusty (left) and mini-Beyoncé get along. 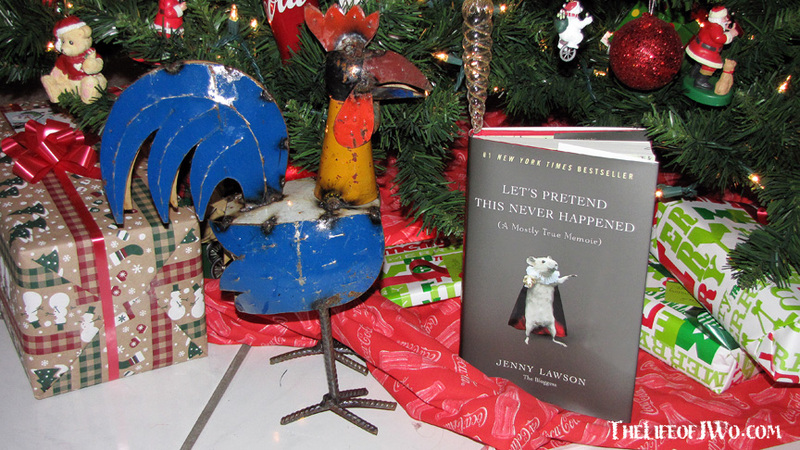 Of course I didn’t learn about that conversation until AFTER we opened presents and I got my own little mini-Beyoncé (I will hug her and pet her and squeeze her) to go along with my copy of Jenny’s best-selling book, Let’s Pretend This Never Happened: (A Mostly True Memoir). I fought back the tears that welled in my eyes as I remembered why I started writing and that we were adding another member to the family. Thanks Mom and thank you Jenny. If it weren’t for you (and Beyoncé) I would have never shared any of the funny (and sad) moments in my life and I wouldn’t have my mini-Beyoncé. Does this means I’ve been good or bad? Gallery | This entry was posted in Daily Life and tagged daily life, humor, Jenny Lawson, postaweek2012, Tammy, writers, writing. Bookmark the permalink. Holy Crap! Her book is so funny. I had tears running down my face at work while reading this book. There were a few awkward moments in my cubicle when my boss walked by and saw my hysterically laughing. You will love her book. So good. I was waiting for it to come out in paperback but decided that I’d ask for it for Christmas. Can’t wait to get into it. Perfect! That book is so friggin’ funny. I’m bummed because I got the e-book, and now I wish I’d just bought it in hard cover. Now I want a Rusty. 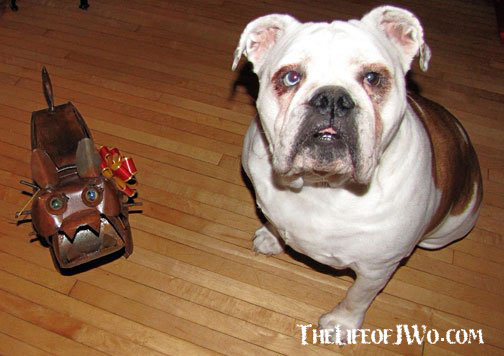 Rusty is awesome… We got it at flea market in Tupelo a couple of years ago. I think it was the same place where Mom found my mini-Beyoncé. I love Rusty and mini-Beyonce! Bet the book is going to be awesome. She cracks me up every time. Hello! I’ve been following your web site for a while now and finally got the courage to go ahead and give you a shout out from New Caney Texas! Just wanted to say keep up the great job!